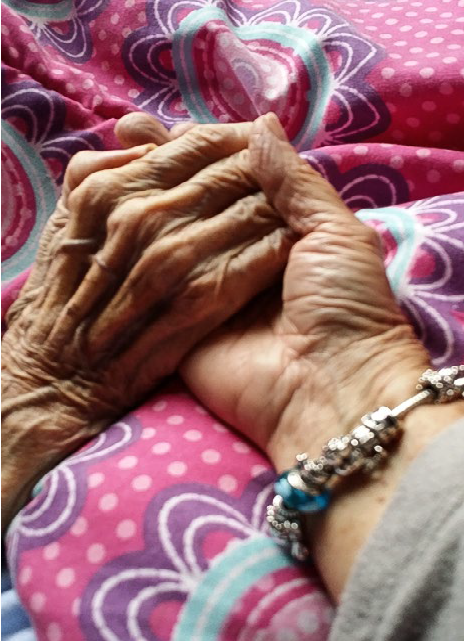 Near the end of her mother’s life, Alinda Lord said that holding hands was the one activity they could still do together. Like many of our family members who care for loved ones who are chronically ill, Alinda Lord had arrived at the realization that taking her mother, Virginia Flovette, to her primary care medical appointments was getting to be too difficult. “I was doing everything myself to get her to an appointment, and it became an exhausting ordeal for my mom,” explains Lord. A full day’s worth of activity was extremely hard on her mother’s frail body, already struggling with the effects of Alzheimer’s disease. Lord knew how tired her mother was and felt a pang of guilt every time she would rouse her from her sleep. “She needed that sleep to keep her strength up,” says Lord. As many caregivers can understand, Lord was frantically trying to do everything, think of everything, and manage everything. “All while my heart was breaking,” says Lord. As a retired home health nurse, she was familiar with the community asset, Housecall Providers. “On our last trip up to OHSU, I let her geriatrician know that I wanted to start using Housecall Providers,” says Lord. It was at that point that life got a lot easier for both mother and daughter. “It was such a comfort to know that someone else was also looking after mom and there for me as well,” says Lord. Now, there was a whole team of support helping her think through options, problem solve, and meet her mother’s needs. “We didn’t have to wait for an appointment at the doctor’s office. Someone was always available and just a phone call away,” says Lord. Lord says, as a true Southern lady, her mother always wanted to make visitors feel comfortable. At the adult care home, even in a wheelchair, she would ask if they wanted something to eat or drink, as if she could get up and get it herself. “She was just that kind of person,” Lord says.